This Wilson H2510 Volleyball Knee Pad, as it can be surmised, is intended for usage in volleyball trainings, games and competitions to prevent different knee injuries, for example, bumps, bruises and abrasions which can be caused by different outer impacts during volleyball games or specific volleyball movements such as digging, diving, spiking and jumping. As volleyball is one of the most traumatic sports which affect knees and joints, usage of knee pads like Wilson H2510 Volleyball Knee Pads is highly recommended. It should be mentioned, that this product is manufactured specially for indoor volleyball – it can be used while playing volleyball in the gym or on hard surfaces. Despite the foam padding, this Wilson knee pad has thin, low profile construction which offers slim and smooth look, not bulky look as most of volleyball knee pads. As mentioned, this knee pad has polyurethane foam padding which provides excellent absorption of shock that comes from blows and other impacts during volleyball games. It also has ergonomic design for superior fit and comfort which will continue to endure after countless practices and matches. Special grooves on cushioning ensures flexibility and mobility, enhancing comfort and performance. This Wilson H2510 Volleyball Knee Pad is ideal for minimalistic volleyball players, because it has minimalistic design and style, namely, it is available in black or white color, it has only two grooves for mobility and flat padding for protection. It has stitched top and bottom for better fit and stability. It also has white Wilson logo on top. 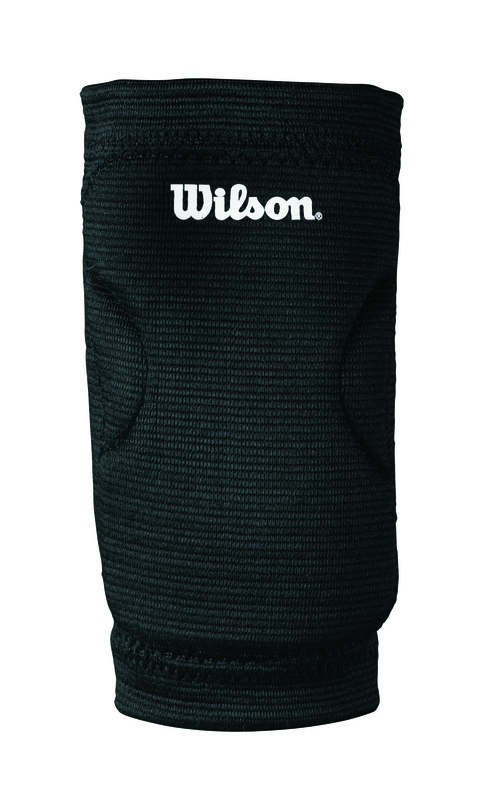 This Wilson Volleyball Knee Pad dimensions are 5.4” x 9.3” x 1.5” and it is available only in one size which, as manufacturers assure, is suitable for most of adults, therefore, it is gamble, whether it will suit for you or not. This Wilson H2510 Volleyball Knee Pad is meant for knee protection during sports such as volleyball to prevent different knee injuries. Its dimensions are 5.4” x 9.3” x 1.5” and it has only one size which is suitable for most of adults. You can get this knee pad in black or white color, therefore, you can choose the one, which is more appropriate to your needs and wants. This Wilson product features low profile construction for slim and smooth look, polyurethane foam padding for shock absorption, ergonomic design for fit and comfort, special grooves for flexibility and mobility. This knee pad can be washed in washing machine and usually it is sold in pairs.